We’re hearing a lot about LED lights these days—and for good reason. LED technology has grown rapidly and prices continue to come down. Here at Roberts Electric, clients who are doing any kind of residential, commercial or industrial improvements are routinely upgrading to LED to save money and the environment. LED is an acronym for light–emitting diodes—they’re semiconductor devices that produce visible light when an electrical current passes through them. LEDs don’t burn out or fail; rather, they depreciate. Their life expectancy is based on when their output has decreased by 30%. LED lighting is found everywhere–Christmas lights, traffic lights, car headlights and brake lights as well as lighting in and around your home. Cities, including LA, Seattle and Boston, are upgrading their streetlights to LED. An LED bulb costs significantly more than compact fluorescent lights (CFLs), or incandescent competitors, but its lifespan is dramatically longer. LEDs cut your lighting energy use and you won’t have to change the bulbs for an estimated nine years—if your bulbs are hard to get to, LED becomes a very attractive upgrade. Here at Roberts Electric, we’re working on a lot of kitchen remodels these days; for virtually all of these projects, homeowners are opting for versatile, energy-efficient LED lighting. We’re installing soft recessed lighting underneath cabinets to illuminate countertops for cooking. These range from 6” to 45” long. LED lights hang over islands and kitchen eating areas where families gather for work, play and meals. Flush-mounted LED ceiling lights provide extra illumination and can be dimmed for restrained light. LED light bulbs may be used in many of today’s beautiful, customized, as well as off-the-shelf light fixtures, including chandeliers. LED also lends itself to outdoor application—low voltage LED landscaping lights are perfect for walls, steps, for use as side lights and may also be used in flood lights. There’s a good reason homeowners and commercial project managers are choosing LED lighting. Reduces energy costs and efforts, using at least 75% less energy than incandescent lighting. Offers convenient features such as automatic daylight shut-off and motion sensors on some outdoor models. Is durable. The bulbs don’t break like incandescent bulbs and are cool to the touch. Colors are bright and pure, measured on a Kelvin scale. Comes on instantly, is silent and doesn’t flicker when dimmed. LED bulbs will fit your existing light fixtures. In most cases, the bulbs are the same size if not slightly smaller than the bulbs they replace. LED bulbs are available at a variety of price points and quality varies accordingly. IKEA’s LED bulbs range from $4-9. As with most things, you get what you pay for. The bulbs at the lower end of the price spectrum do not last as long and do not come with a warranty. A recent consumer review rated the Cree 60W as an industry leader—cost is $10-15, but this bulb comes with a ten-year warranty. COSTCO also carries high-quality LED lights. 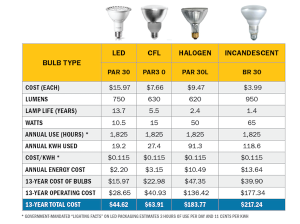 This table compares initial cost and operating expense for a single LED PAR 30 bulb with the equivalent CFL, halogen, and incandescent bulbs. Given that many of the numbers used here are more conservative than those in the government-mandated “Lighting Facts” table found on lamp packaging, this table represents a “worst case” scenario. The 15,000-hour LED bulb life estimate is itself conservative. In a fixture specifically designed for LEDs, bulbs can last two or three times longer (40,000 to 50,000 hours). There are several steps, but essentially this is no more difficult than a bulb and ballast replacement. Remove the fluorescent tubes, and then remove the ballast. Replace the existing tombstones (only if necessary). This step may be required with single ended powered tubes if you have shunted tombstones. Rewire the fixture to accommodate the LED tubes.